Photo Is From a Vintage 1917 M. Heminway Pattern Book, From the Collection of Sandi Marshall. Fashion always comes back around, with the old styles getting a modern update just a few decades after they were last popular. And yet, there are some items that were worn years ago that we just don't usually wear a lot anymore. A few of these have made comebacks recently as crocheted items; the crochet cloche hat is a great example of a 1920's fashion accessory that's popular today. 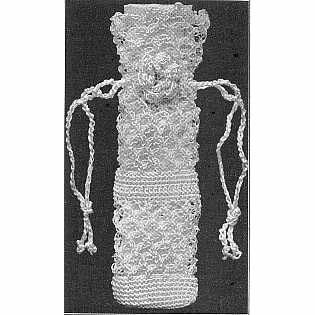 There are also a few other cool vintage items that haven't quite made the comeback but could be re-created in crochet today for a really original look. The fascinator was first made popular by Marie Antoinette and then had a fashion revival in the Edwardian era. Despite this, most of the people had no idea what a fascinator was until the lacy, feathery head ornament burst back onto the fashion scene in 2011 when several stylish guests wore them to the highly publicized royal wedding of Kate Middleton. The snood is a hairnet for a woman's bun that was especially popular during the Renaissance era. Hair snoods made their big revival in the late 1800s when they were often worn by unmarried women in Europe. And they were brought back into fashion again during World War II. It sounds to me like it's perfect timing for the snood to make another comeback in fashion. Crochet is the perfect medium for making snoods since they are openwork lacy items. Do a search around the web and you'll find several patterns for crochet hair snoods. This vintage fashion item has made a recent comeback and it might be here to stay for awhile. The Peter Pan Collar seems to be the most popular inspiration for designs; it was originally made popular in sewing designs in the early 1900s. Craftsy has a cute crochet collar pattern roundup if you want to try a contemporary version of this accessory. Collars aren't the only vintage neckpiece that can look really cute when crocheted. The jabot is another fashion item that ought to make a comeback. This word originally referred to the ornate ruffles on shirts in the 17th century but then became popular as a neckpiece on its own around the 1930s. At that time, there were some designs in crochet. Clothes Tell Stories explains that "these small purses with center slit openings and sliding rings or clasp closures were ubiquitous throughout the nineteenth century." They were also called finger purses. The purses were popular for use as coin purses until the 1920s.